I know what we're going to do today. Chill on the landspeeder. After last year's cartoon mashup Phineas and Ferb: Mission Marvel, it was only a matter of time before series creators Dan Povenmire and Jeff "Swampy" Marsh took on that other recent Disney acquistion. And lo, Phineas and Ferb: Star Wars was born. The nerdy-cool half brothers will cross paths with Luke Skywalker, Darth Vader and a host of other Star Wars characters when the one-hour special airs on Disney Channel Saturday, July 26th at 9:00 p.m. Eastern/Pacific. Verified users on WATCH Disney Channel and Disney XD on Demand can catch a first look at the show a week earlier on July 19th. 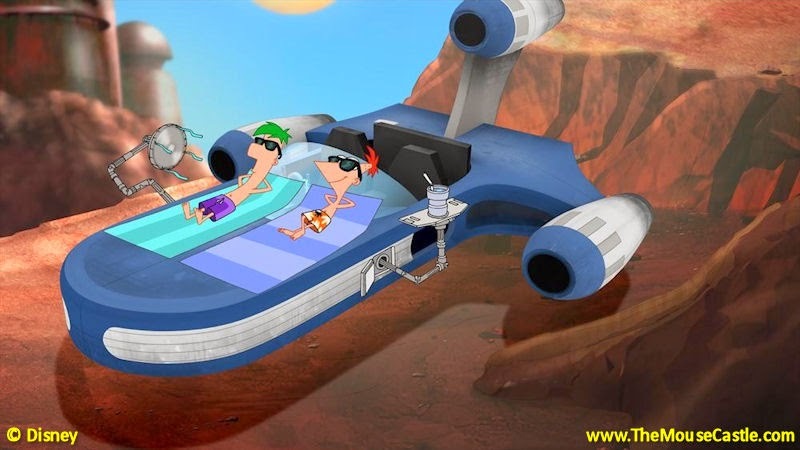 In Phineas and Ferb: Star Wars, the boys live on Tatooine one moisture farm over from Luke Skywalker. Paralleling Star Wars: Episode IV, they find themselves embroiled in Imperial intrigue and adventure when R2-D2, replete with Death Star plans, inadvertently ends up in their landspeeder. Then, it's up to Phineas and Ferb to return the plans to the Rebel Alliance and save the galaxy. All the characters you expect from Star Wars will make appearances including Han Solo, Princess Leia, Chewbacca and C-3PO, plus the Phineas and Ferb ensemble of Stormtrooper Candace (you are so busted, rebel scum! ), pilot Isabella, Evil Dr. Darthenshmirtz (with his new Sith-inator) and, of course, Perry...the Rebelpus? Phineas and Ferb: Star Wars will be available for purchase on iTunes, Amazon Instant Video, Microsoft Xbox and Google Play on July 27th. The special will be part of a Star Wars-themed night of programming on Disney XD on August 4th.